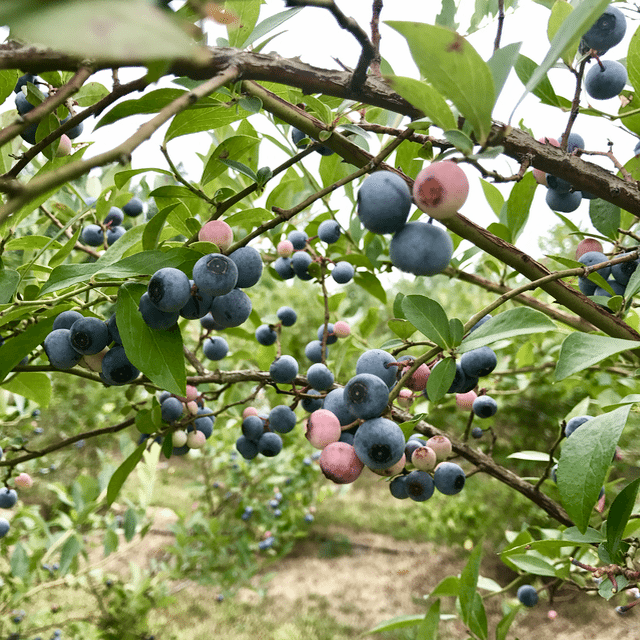 It’s summertime and we are fortunate enough to have some amazing pick your own fruit farms within an hours drive from our home. If you don’t have that in your area, one of the best things about summer is the abundance of fresh fruit available at your food markets. 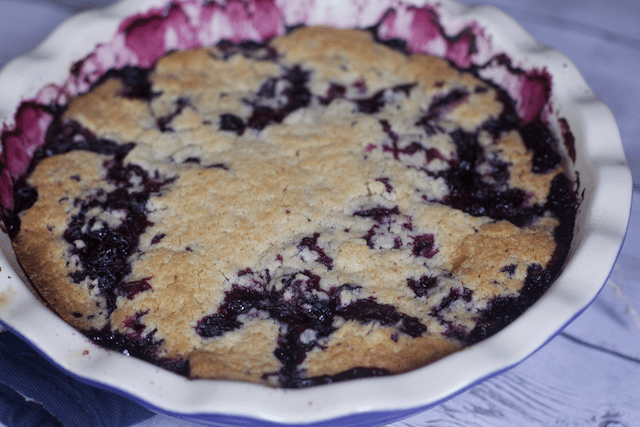 Since we took a quick trip to the blueberry patch last week and came home with over 8 pounds of blueberries, we decided to create The Only Blueberry Cobbler Recipe You Will Need! 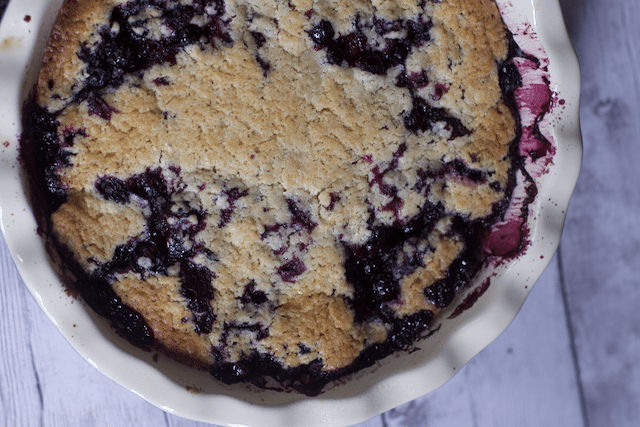 Cobblers are super easy and are basically just a slab of fruit with a light cake topping. Cobblers are great desserts for a crowd. 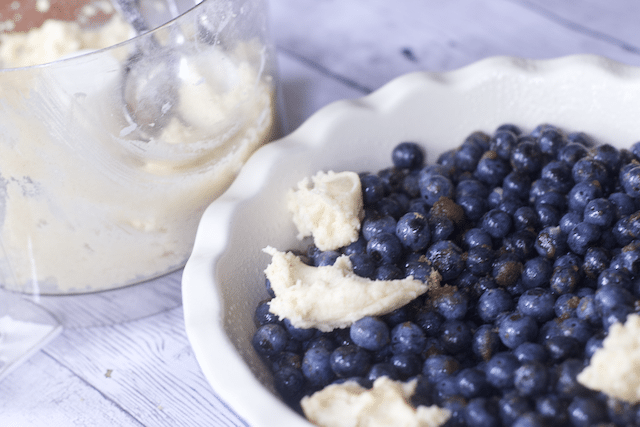 Did I mention how easy this blueberry dessert is to make? 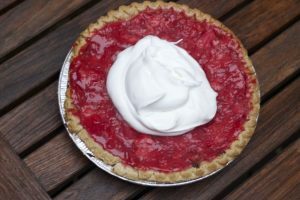 Just coat your fruit with a little brown sugar and a tablespoon or so of Orange juice and dump into a nine-inch pie plate. 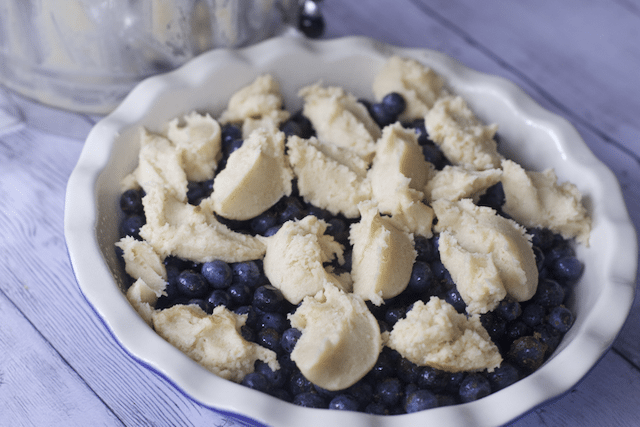 Our cobbler topping was made in a food processor, Add the cold butter and mix of dry ingredients into the bowl of the food processor. Process the ingredients until you get crumbles. Add an egg and vanilla extract and pulse until mixed thoroughly. Drop tablespoons of batter on top of your fruit and bake until golden brown. It is ideal to bake this an hour before you are ready to serve dessert. The ideal is not really all the time. I made this earlier in the day and then just heated it slightly in a 200 degree oven until warmed. Don’t forget the ice cream if you have it. There is nothing better than the warm cobbler with a scoop of cold vanilla ice cream! Enjoy the flavors of summer. Although this is good slightly warmed out of the oven, it was just as tasty the next day for breakfast, cold, with a cup of coffee. This is a versatile recipe that you could mix and match many different fruits. 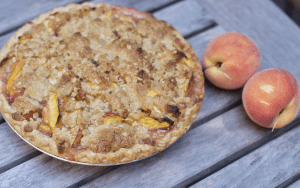 What type of cobbler will you make? 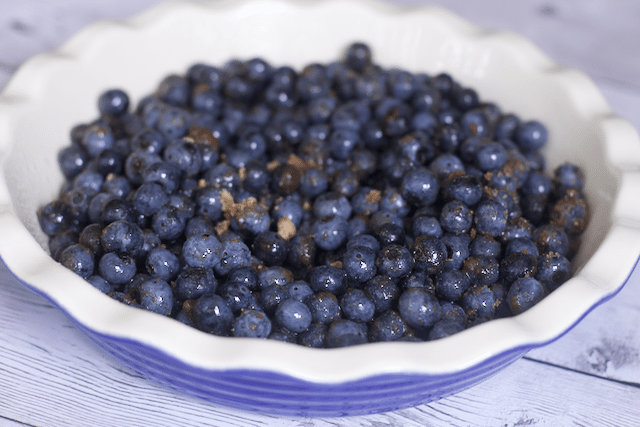 In an 8 inch square baking dish or 9 inch round pie dish, mix blueberries, 3 tablespoons sugar, 1/2 tsp cinnamon and orange juice. Set aside. In a small bowl, thoroughly mix flour, baking powder, cinnamon and salt. Set aside. 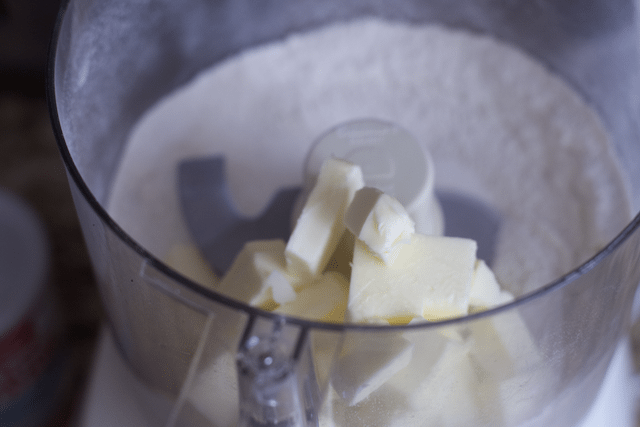 In a food processor bowl pulse butter and 1/2 cup sugar until light and fluffy. 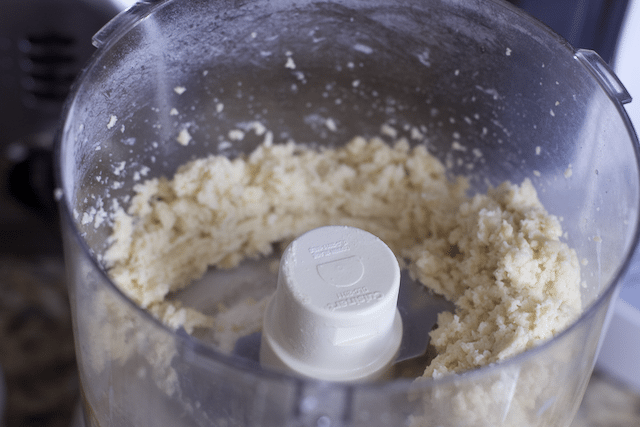 add Flour mixture and pulse for 10 seconds or until crumbly. Add egg and vanilla extract. mixing just until ingredients are combined. Drop batter by rounded tablespoons over blueberry mixture. Try to cover as much of filling as possible. Best served immediately and warm with a scoop of vanilla ice cream. Yes any seasonal fruit would be great in this recipe. Yummy! 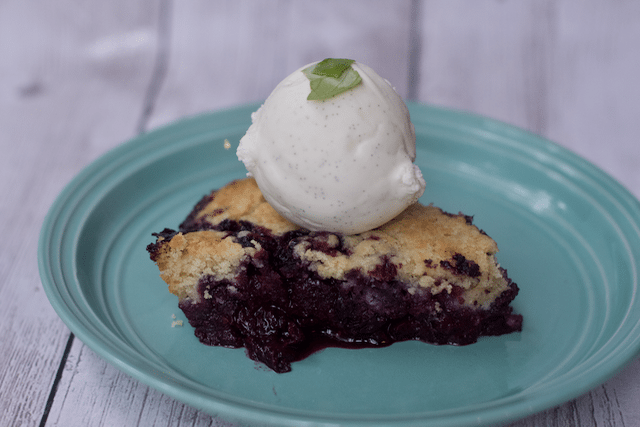 This blueberry cobbler looks so tasty especially with a scoop of vanilla ice cream on top! I love how easy this recipe is. 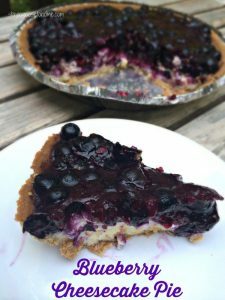 I need to try this recipe soon since blueberries are in season right now. I love a good cobbler a la mode. I haven’t had blueberry yet, but yours looks incredible! 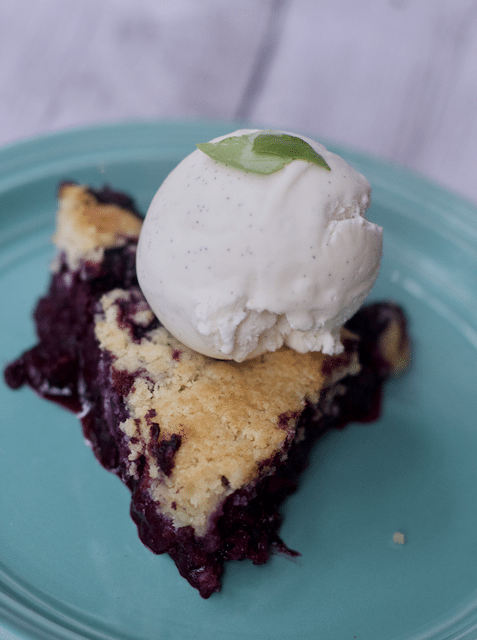 What it is about a baked blueberry that is so good? I love how the juices spread out all over the cobbler. Looks fantastic. I like that you can also switch out the fruit for whatever is in season! It really is an awesome cobbler recipe. That looks nice. I like fruit desserts, and cobblers. Thank you for sharing this one Joy of Desserts.